What do Retirees and an older generation want? Read PerthALIVE Chair Maxine Murray’s contribution to a joint presentation (titled An Unexpected Partnership: Different Generations Seeking Similar Housing), between PerthALIVE and FuturePerth to the International Cities Town Centres & Communities Society Conference in October, 2013. The joint presentation challenged traditional assumptions about what different age groups want from their cities and housing. I am a 64 year old baby boomer. My partner and I are very happy in our current home, a downsizer we built 12 years ago after the kids left home. It is a smallish 3 bedroom, 2 bathroom single storey home on a 430 sq metre block. Ideal you might say, and in many ways it is. So, why would we want something different? As we look to the coming years we realize we want to be closer to amenities but within a location near to our current home and networks. Basically we want a socially sustainable community where the quality of community life is a central consideration. We want it to be an amenity rich and vibrant environment. So this means mixed density mixed use developments next to or on top of major urban centres and situated on a major transport node. 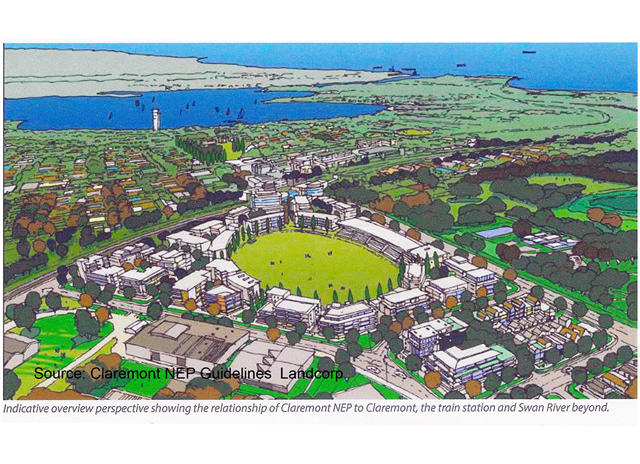 And I mean developments not just a single apartment block because, as I will explain, to achieve the kind of amenity we want it needs to have a several hundred residents, such as this one – the planned development around the Claremont Football Oval. While it is often called ‘downsizing” we still want spare bedrooms that we will turn into multi-use spaces. We take our grand parenting very seriously, so these extra one or two bedrooms easily become both hobby spaces and spaces for guests and the grandchildren to stay over. And we want a balcony big enough to accommodate some plants and a family sized dining table and chairs for our family dinners. But of equal importance to is the quality of community life and therefore the quality of the communal spaces between and around the apartments. So we want opportunities for incidental encounters both within the buildings and within the outdoor spaces. We want outdoor spaces that can be activated in ways that suit all ages. We would like there to be easy access to things like vegetable gardens, men’s sheds and art creation spaces such as studios, gyms, a pool and access to walking paths. Many of these could be community resources not just for residents. There could be things like an oversize chess game next to a coffee shop overlooking an open space where there is also a children’s playground. We want plazas where there are no cars and the opportunity to draw people into the area through organised events such as second hand book fairs, open air exercise classes, food events to suggest just a few. As a group, my baby boomer friends are quite used to organizing and making things happen in our communities through our volunteer work and there is no reason for this to change. In other words we would be active partners in creating great urban spaces for the whole community to enjoy. So we want a great place to live and a place that suits our changing age and needs. This brings me to the final must-have in our ideal development and why it needs to be a large development. And that is the presence on-site of services to meet our needs as we age. PerthALIVE approached the Aged Care provider Amana Living and they developed a proposal of how such services could be provided to what we estimate might be the 10 % or more of residents who may need this. They provided us with extensive service options for which residents can pay an access fee. Because there would be a concentration of clients in one location they would see themselves having a presence on site that would be visible but unobtrusive, one that recognizes lifestyle as well as support services that are practical, make life easy and provide peace of mind. While I don’t have time here to go into the detail this proposal fits with the Commonwealth Government’s move to consumer control and choice. It is a support service, which can become one point of contact for coordination and navigation when the service level reaches the government funded levels for more intensive personal care. So these are our plans for how we want to age in place in an inter-generational environment.